With plans for a third Bridget Jones movie still managing to advance no further than an asthmatic ant with some heavy shopping (to quote Blackadder), we’ll have to make do for now with Man Up, which also happens to be about a 30-something woman, played by an American actress putting on an accent, who makes lists in a book detailing the best way to get herself a lover. 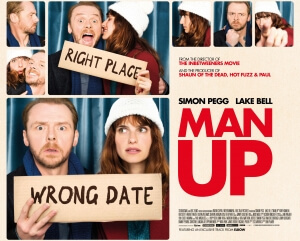 Thankfully the comparisons begin and end right there, as Man Up is a surprising delight of its own accord that should please the average romantic-comedy enthusiast, even though the expected tropes of the genre eventually start to shine through. Its two leads, arguably one of the most important essentials of the genre if not the most important, are undeniably sparky together. You can sense the connection between Lake Bell’s Nancy and Simon Pegg’s Jack from their first moments together on-screen, and they work off each other lovingly well from there onwards. Pegg, in full Spaced mode, is his usual reliable self as the 40-odd divorcee and gets to be looser than we’re probably used to seeing him, while Bell not only manages to pull off that tricky Brit accent to a tee but also gives her character a much more defined personality than most other dorky rom-com types, even if you don’t agree with her undeniably sociopathic decision to effectively steal another person’s blind date. Their on-screen chemistry is sizzling with playful banter, and it’s endlessly amusing to see their polar opposite personas bounce to and fro at various points. The humour, so rarely done right in a romantic-comedy, is also very enjoyable if not completely laugh-out-loud hilarious. Most of this does stem from the interactions between Nancy and Jack, as well as Rory Kinnear’s creepy school friend of Nancy’s who inconveniently shows up to throw the wrench into the works in the most cringe-inducing ways imaginable. Kinnear’s character is a strange one; obviously there to be the main obstacle between the main romantics but also the light-hearted (to a point; we learn that he used to spy on Nancy at her home during their days at school) buffoon that relieves the tension, his is a character that’s never quite defined on what he should properly be. Either way, his overall oddness and his extreme methods of getting his desired prize make for some uncomfortable laughs, as does a later set-piece involving Jack’s ice-queen of an ex-wife (Olivia Williams) and her lover. As is with a rom-com, however, a certain formulae must fall into place at some point in the narrative, but for the most part – at least up until the third act – the film does its best to steer as clear from the beat-by-beat tropes as is possible. The eventual reveal of Nancy’s wrongdoings, a revelation that would usually be saved for the end of the second act, is gotten out of the way earlier than most may be expecting, and while there is the expected resentment phase between both parties – especially from his end, quite rightfully – it’s soon tossed aside when it arises that there are more important things to worry about between them. It makes what follows a bit more up in the air, though we all know where it’s most likely going to lead, but at least there’s one cliché refreshingly gotten out of the way sooner rather than later. That third act is when things seriously start to become much more conventional, at least within this particular genre. You’ll know the tropes when you see them, with the unexpected addition of drunken teenagers – a slight nod to director Ben Palmer’s previous film The Inbetweeners Movie, perhaps? – and even a Ferris Bueller-style car jump, but no matter how standard and non-fresh the clichés can get, they do still add up to something undeniably charming and heartfelt. 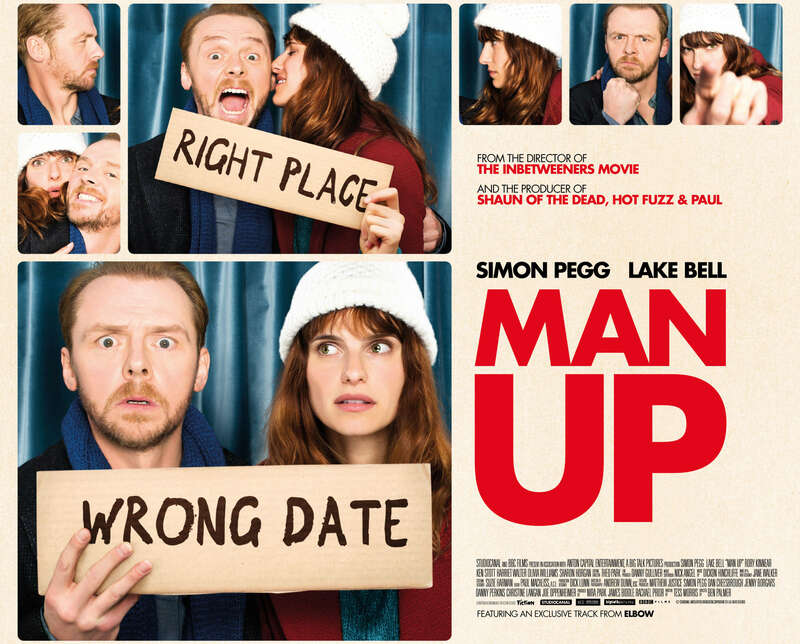 Rom-com cynics certainly won’t get much joy out of the formula on display here, but for anyone seeking a decent, charming and relatively harmless romance in the City of London, then Man Up may just do the trick. Man Up may not change the rom-com formula that we all know and mock, but it’s a charmingly told tale anchored so well by the lively and sizzling chemistry between Simon Pegg and Lake Bell (the latter of whom pulls off a convincing English accent) and its enjoyable sense of humour that you won’t end up minding its descent into full-on cliché in the third act.